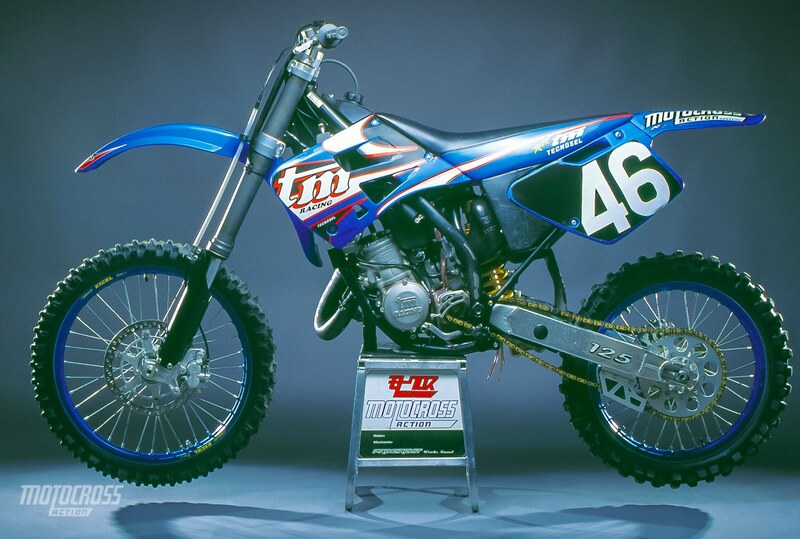 A close look at the 199 TM 125MX will reveal plenty of changes from the 1998 model. However, if you are like most people you won’t recognize those changes because you’ve never seen a TM before. 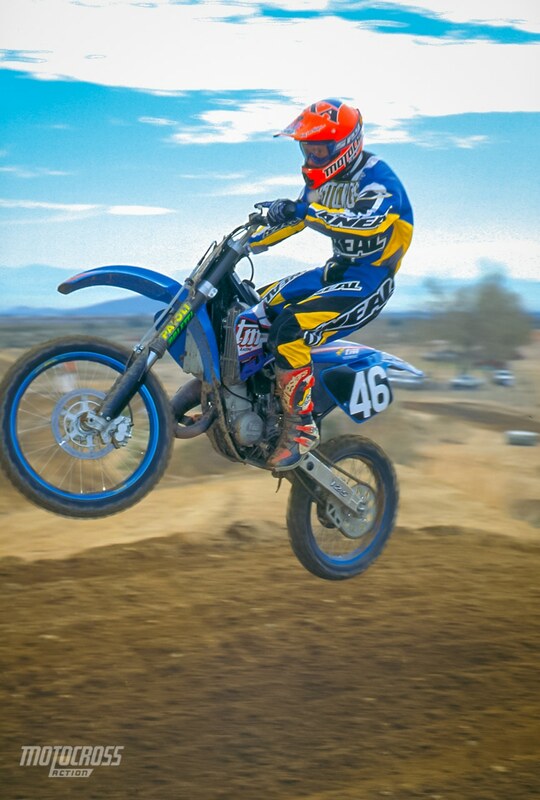 This test of the 1999 TM 125MX is from the May 1999 issue of Motocross Action Magazine. 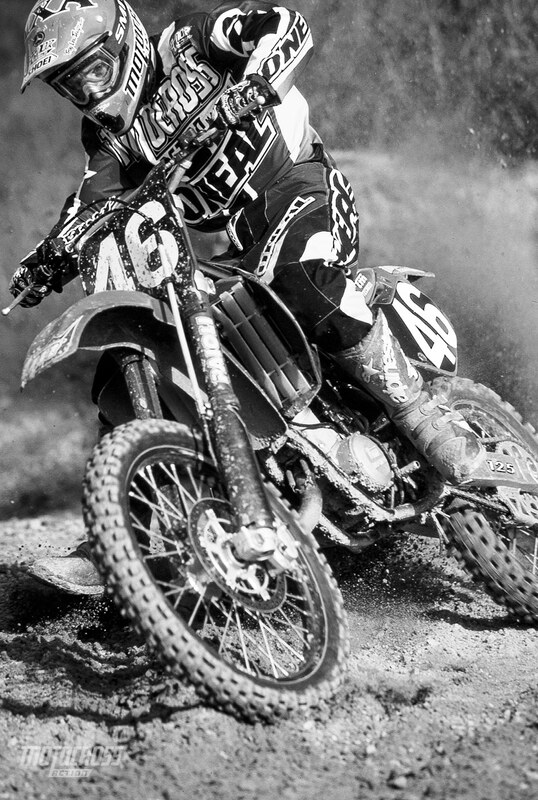 (1) Test riders had to come to terms with the Euro handling. Although the 1999 TM turned light years better than its predecessor, it still had a tendency to push on flat turns. Additionally, the front fork deflected with alarming ease off of rocks, ridges and rills. 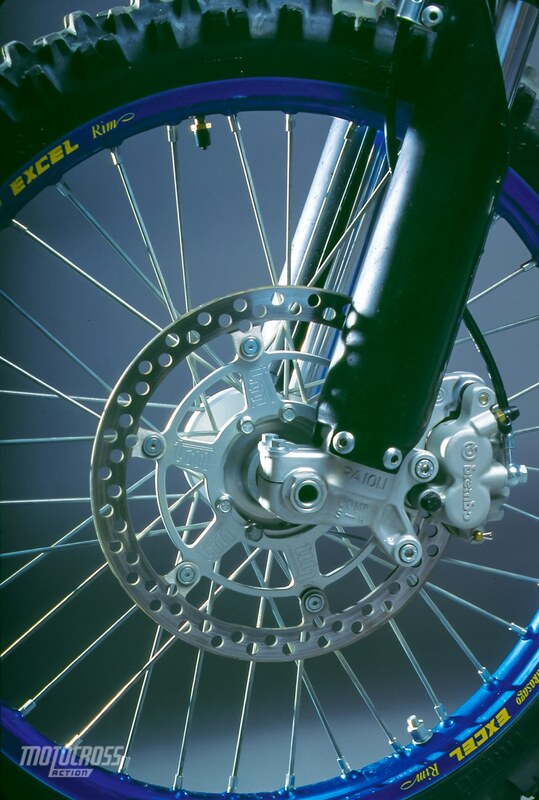 The front wheel would snap to full lock for no obvious reason. This got our attention. (2) The power comes on in RM-like bursts — sort of. Blessed with a stout midrange powerband, the TM churns out a healthy chunk of thunder. However, there is no low-end and, unlike the RM125 that its midrange emulates, no over-rev. We tested two TM125 pipes. The stock pipe produced lots of top-end rev, but less low and mid. The aftermarket pipe (that TM advised we use) was considerably stronger in the middle, but signed off sooner. 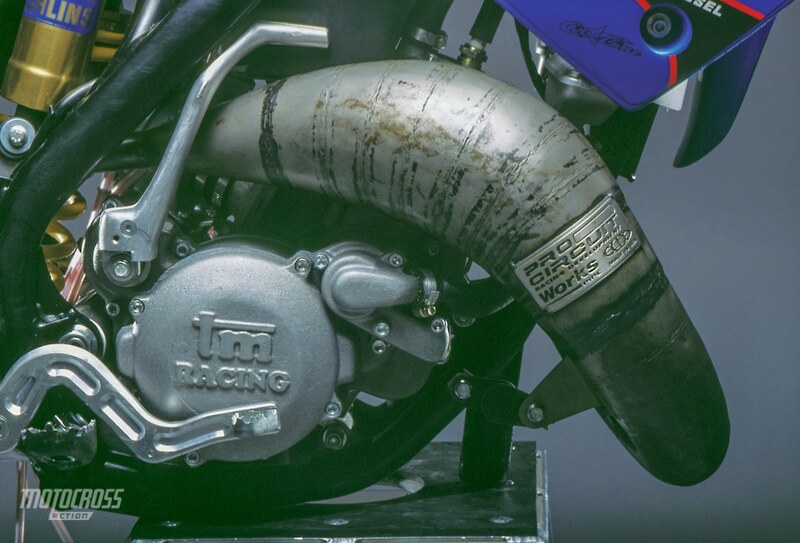 Of the two choices, every test rider preferred the harder hitting midrange pipe. 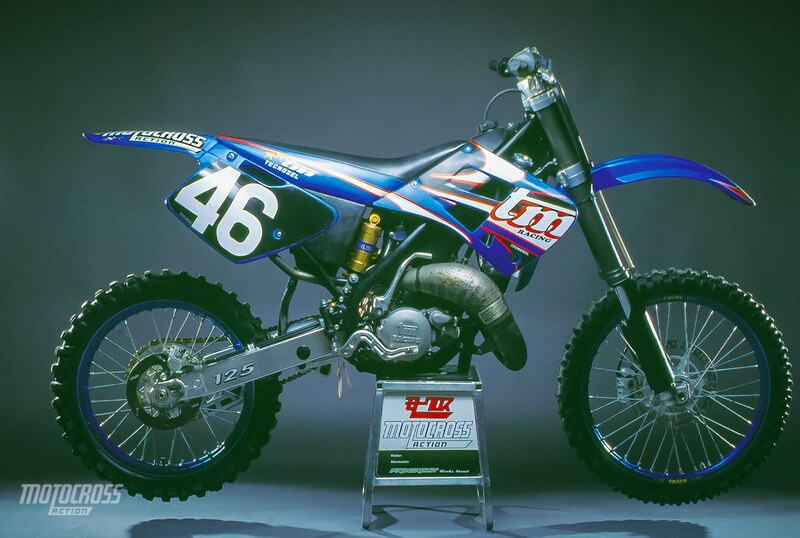 The best parts of the 1991 TM 125 were the midrange powerband, Ohlins shock, Alloy gas tank, and readily available Japanese plastic. The worst part? The rest of the bike. Midrange engines depend on slick-shifting trannies to make the bark work. TM needs to spend more R&D dollars on their gearbox. It misses a lot of shifts, especially when you are trying to rush them (and that pretty much defines racing). The shifter shape is atrocious. It looks like a pretzel. The only way to guarantee a shift was to shift early and back off a notch. 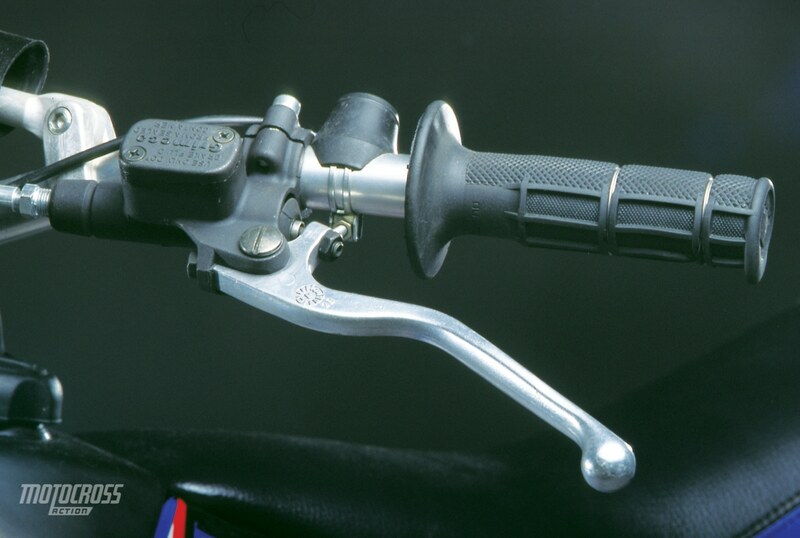 Let it be known that TM was the first to equip their bikes with a Magura hydraulic clutch — KTM copied them. The bad news is that although TM was first, they aren’t the best. The TM’s clutch actuation is more of a light switch than KTM’s. This problem is caused by a combination of plates, springs and leverage ratios more than simple hydraulics. We filed the clutch lever down and sanded out the square shape. We complained about the forks loudly enough that TM made a fork upgrade midway through our test period. We looked forward to the Fed-Ex shipment from Italy. Unfortunately, the updated ‘99 valving performed with the same low amplitude harshness, deflection and spikes as the first set. We have had great luck with the new 50mm Marzocchi fork. We can’t recommend the Paiolis. Good news! 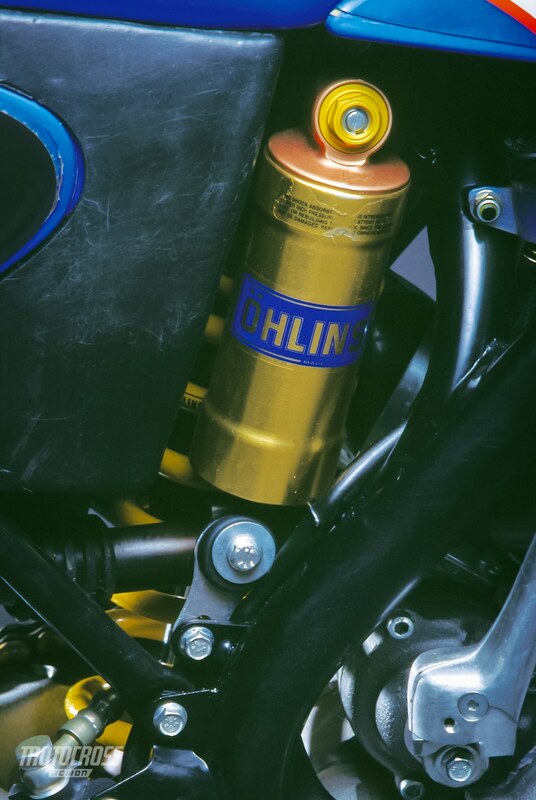 The Ohlins shock was significantly better than the Paioli forks. 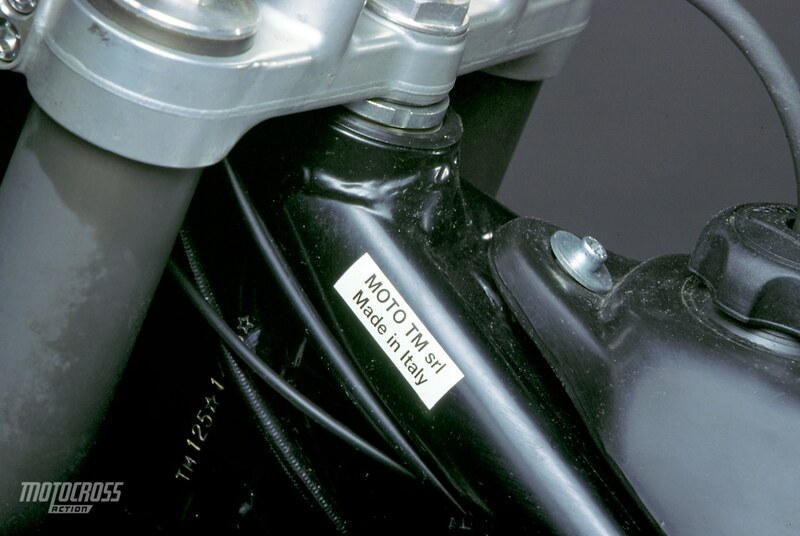 Given the fact that the shock had to do double duty —to make up for the fork’s inability to absorb any bump smaller than a jump — the Ohlins could only work better if mated to the Marzocchi forks. Overall rating: Even with the litany of complaints, the MXA wrecking crew would choose to race the TM 125MX before we’d volunteer for several Japanese brands. Choosing to ride a TM carries with it all the risks of small, cottage industry, works-style production. This is not a mass-produced machine. It’s very much a work in progress.